Today I found three more fuchias that had stayed alive over winter bundled in bubblewrap on the front porch. There were one or two other things that might be alive, if given the luxury of a drop of water. I suppose the point is to be pleased about what has worked rather than think about what could have been saved with a bit more organisation. Sometimes Bacopa survives the winter in the right place but not this year. I also used to keep the grey leaved foliage plant going (helichrysum). Still my mother usually overwinters that by her backdoor so I can borrow some. Next year we might have a greenhouse and all sorts of things will over-winter under the benches. It makes huge sense to overwinter some of the stock plants for the pots as that way you start with bigger plants that are FREE. Also you have the measure of each of them, will it really trail or will it give up half way through the season? Things like the Erigeron Profusion or Mexican Wall Daisy are good as they fill in and are white with pink which means they go with lots of other colours, they are as happy in pots as in cracks in the pavement or trailing down hot sunny walls. They can be grown from seed and once you have a happy plant, you will be certain to have some new ones come up each spring, it’s then just a question of remembering what they look like when small and not weeding them out. I also keep a clump of stripy grass or Gardeners Gaiters in a pot; it is very invasive in a bed and hard work to remove but in a pot it is fresh and lovely and only needs cutting down once a year in midsummer to stop it going messy. It works well with other stuff planted among it and provides foliage fill for free. The other bit of the garden that is taking off is the strip of roof garden over the log store, there are buds of Dryas Mountain Avens nodding in the wind and one Lewisia has made it and is getting on with flowering seriously. 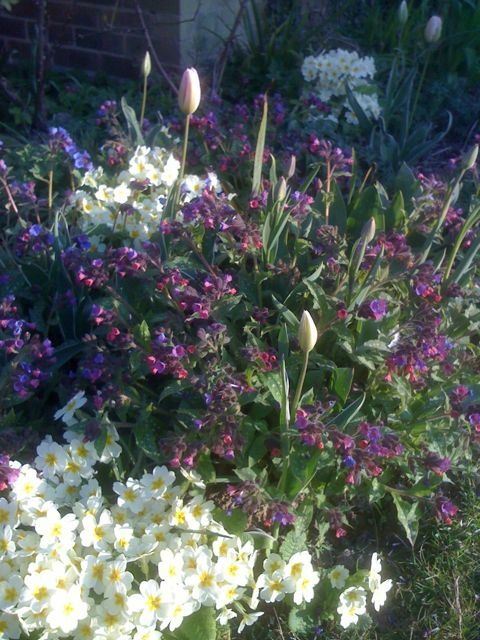 The dwarf phlox is purple with flower and the night scented phlox is about to open its first flower. I need to go up on a ladder though as I can see weeds getting a grip too in the gaps. It was so seriously dry up there I put water on it today; the top end was looking dessicated. 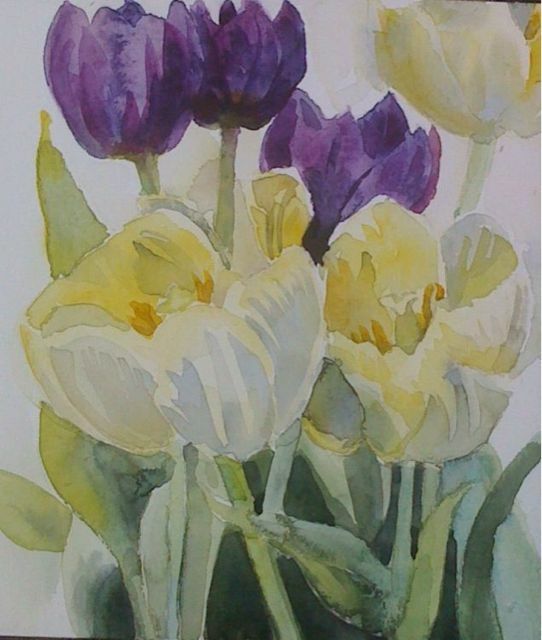 I have done a painting of some tulips today. The strawberry theme continues although there is some background here. 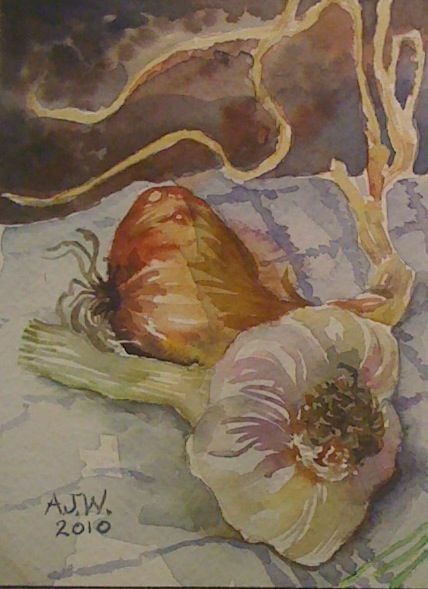 I have made this very loose and applied the paint wet on wet and then in some places flooded it with oxgall. Today I put out a big group of Tiarella seedlings in the shady area that got flattened recently following the build. The soil is very patchy; there are areas where I was digging holes and then throwing into the hedge base the yellow lumps of clay that I dug out. At least if I scrape around there are bits of soil to be found in places. I watered all the young plants very well and top dressed with a mixture of mulch and chicken manure pellets. There were one or two little seedlings of some species geranium that had emerged from the compost after I pricked out the baby Tiarellas. I hope they don’t mind shade. I also went looking for patio pot survivors from last year , this was quite productive, I have four white fuchia Annabel, four fuchia in shades of pink trailing which made it indoors overwinter, several Erigeron Profusion which is trying to flower, two diascias, several rooted cuttings of Pelagonium on the kitchen window sill plus three parent plants and lots of trailing nepeta which is also starting to flower. In addition there are two good plants of fuchia Thalia indoors still. One or two pots that I have dragged out from shelter have some interesting looking seedlings too. I only really need to buy some lobelia as I have one e-bay pack of mixed hanging basket plants being brought on. Things are really moving fast in the garden, lots of big hitters are out or ready to go any minute . The clematis Montana is almost out , the honeysuckle Dropmore Scarlet likewise. There is a delicate bush honey suckle opening with pink flowers L. tartarica I think . 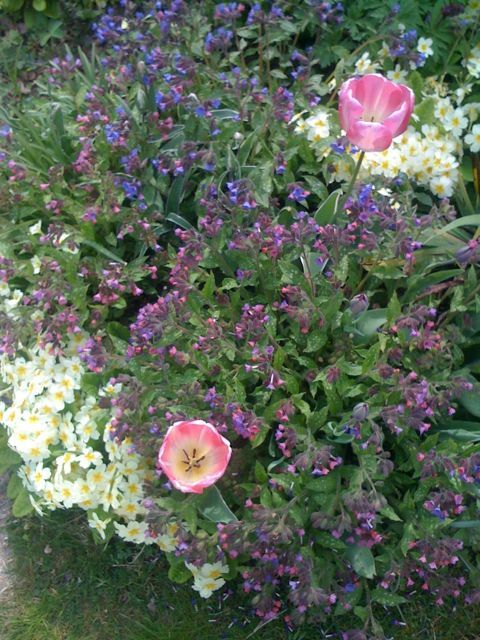 My star bit of permanent planting is at its peak, here is a sequence of photographs. First shows the tulips still in bud and yeaterday there they are open in the sun. You can just make out the striped leaves. The art exhibition was better than expected although it was clear that another class had had one really good project that exhibited very well and looked like they had enjoyed it. I was out of order here as I could have bought some English strawberries grown under plastic but they were the favourite with the growers Elsanta and they always disappoint on taste. 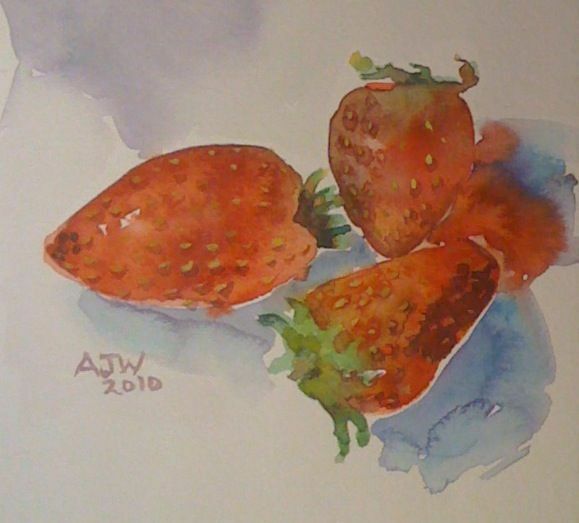 I suppose they last a long time on the shelf and work better for the supermarket, but a strawberry is nothing without taste and perfume. So unless I require something sturdy and scarlet to decorate a cake or display I shall not buy Elsanta; it is ruining the reputation of strawberries everywhere. This strawberry filled the studio near me with its perfume which was quite a task as the garlic from yesterday is still there. Today I went to Sheffield Park a very beautiful garden belonging to the National Trust near here. 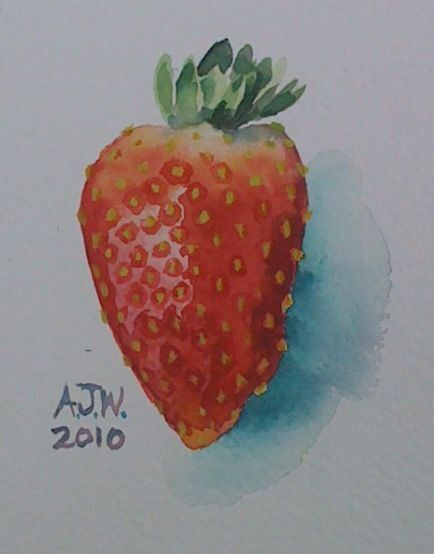 I took my paints but there was too much there for me to settle and find a small subject for a quick small picture. The highest of the lakes was covered in waterlilies and something with oblong leaves and pretty frilly white flowers. I should have liked to try that but it would have been an all day task. A swan crossed the lake perhaps thinking my painting bag contained crusts. 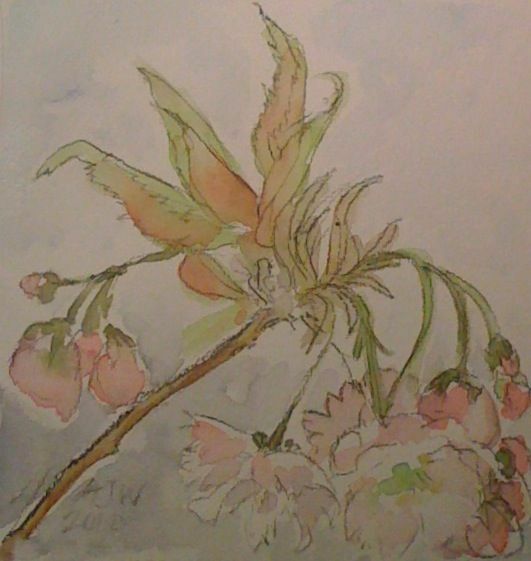 There were dogwoods with big flowers, soft deep purple cones on low growing firs and more azaleas, magnolias and rhododendrons than the mind can take in easily. At home the plants are finally going into the area formerly known as the Somme. Last night husband transplanted the magnolia, I know it’s very late but there is rain due at the weekend. It will need cosseting with regular water all summer now. Two of the bamboos went in and most of the rest of the planting it placed on the surface…the gaps are huge as this will be an area of big plants providing screening and a backdrop. It’s going to look rubbish for a couple of years at least. I am also going to have to find a cheap and cheerful temporary groundcover plant. It will be No.1sons GCSE art exhibition (the one he forgot to mention) this evening . A must see, my friend and I wish they would put the boys and girls stuff separately as we can’t help expecting that the girls will have done so much more. There are several times in the year when you get something really special that doesn’t come all the time. At the moment there are the wild garlic leaves in the woods and from the supermarket fresh garlic from France. The first delicate broadbeans are another thing that is special. I like to make a pasta sauce with the fresh garlic if I can still get it, a packet of philly or similar cheese and a cup full of pea sized baby broad beans just slightly cooked. Salt ,black pepper fresh thyme…that is all. Never get tired of it there’s no real chance to. The shallot is one I grew by the back door last year; they have stored really well. Today was meant to be the warm one so like the suckers that we are we invited people over for a barbeque….so it rained for the first time in weeks, then the wind blew a bit, then the sun shone a bit and I thought maybe…then it went in and looked sulky; gave up the barbeque idea. We did go out and find a bluebell wood which was glorious and scattered with white wood anemones. In this wood however some of the anemones are pink flushed, which you don’t always see. 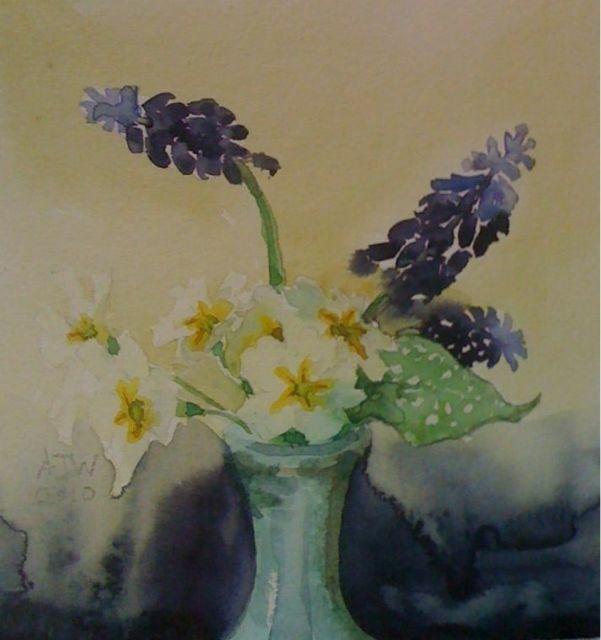 Have done another version of the painting from Friday as I wanted to get more of the lovely little vase which came from a very elderly potter Ursula Mommens. She died earlier this year at the magnificent age of 101. I bought the vase from the pottery where she worked in the last seven years, so she was in her nineties when she made it. I first bought a piece of hers when I was on a’O’ level geography field trip to the Seven Sisters cliffs; it was a present for my mother .Now I find that Ursula Mommens had worked with Michael Cardew, a well known British potter ,who was married to my school art teacher . She was also a descendant of Charles Darwin. The world is smaller than you think.